The utility scale solar power plants require various equipment such as inverter, string combiner box, Weather station, Transformer, Multi-Function Meter (MFM), Tri-Vector Meter (TVM), Trackers, Fire alarms and Vacuum Circuit Breaker (VCB). All equipment in the plant should be monitored to increase plant availability, functionality check of each equipment and for datalogging. Modbus is a standard that is open and is widely-used network protocol in the industrial manufacturing environment. It’s a common link that has been implemented by hundreds of vendors for integration on thousands of different manufacturing devices to transfer discrete/analog I/O and register data between control devices. 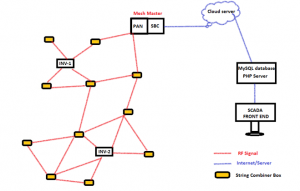 A MODBUS communication is always initiated by the master node to the slave node. Our EagleSunTM sense node interfaces with Modbus output of equipment, the EagleSunTM sense node converts the sensed data packets to 867MHz RF signal. The sense nodes form self-organising/self-healing cluster to relay the data packets to the Base station/Mesh master. Base station/Mesh master is a central component in a wireless SCADA system, as it collects equipment data, processes the collected data and sends the processed data to the server. In network/cluster formation, one of the sense nodes acts as the master and rest of the sense nodes act as slaves. A network/cluster consists of following layers. Top layer: Consists of Base station/Mesh master, which collects all the sensor data through master nodes, and this collected data is processed to form a single data packet, which is then sent to the server. A master in each layer controls many slave nodes in the lower layer by polling mechanism, to gather data. The master node transmits broadcast message to the slave nodes. When all master nodes finish broadcasting message, slave nodes select a master node as the most preferred master node, second most preferred master node and so on depending upon the received signal strength. In normal conditions each slave node relays its data to the most preferred master node. In case of low signal strength or low battery power on a master node, the slave node finds the other path (Self-healing) through second most preferred master node to relay its data packet to the Base station/Mesh master. So, the slave nodes have the capability of self-organising and self-healing which improves reliability of the entire system. Delivery reliability can be achieved by proper selection of the Master node count. If the number of sensors in Hierarchy “i” is NSi , the number of elected Masters NMi in this hierarchy will be set to more than sqrt(NSi) so that each slave node can find other paths to relay its data packet to the Base station/Mesh master even in adverse conditions. Thanks Raju Kaki. Please add more information in your following article on the subject.